Grande Market Square at Nicollet Avenue and Burnsville Parkway is the cornerstone of the Heart of the City project. Burnsville has many attractions, including its regional mall, Burnsville Center. The city is also a recreational attraction with Alimagnet Dog Park, a section of Murphy-Hanrehan Park Reserve and 310-foot (94 m) vertical ski peak Buck Hill. Minnesota River wildlife is protected by the Minnesota Valley National Wildlife Refuge. 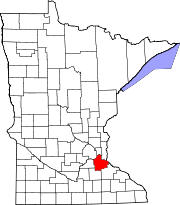 Originally a rural Irish farming community, Burnsville became the tenth largest city in Minnesota in the 2000 Census following the construction of Interstate 35. Currently the ninth largest suburb in the metro area and a bedroom community of both Minneapolis and Saint Paul, the city was fully built by the late 2000s. Burnsville's downtown area is called Heart of the City with urban-style retail and condominiums. The Burnsville Transit Station serves as the hub and headquarters of the Minnesota Valley Transit Authority, providing regional bus service to five other suburbs. Horses baling straw circa 1900. Interstate Highway 35 splits into Interstate Highways 35W and 35E within the city. Other routes in the city include Minnesota Highway 13 and County Road 42. The earliest settlers were roughly 250 Mdewakanton Dakota who lived permanently at Black Dog camp. Starting in the 1850s, Old stock Americans from the east coast and French Canadians moved into eastern Dakota County near Saint Paul. A decade later, major European immigration began with settlers from Ireland, Scotland, and Great Britain. By the 1900s there were a few Scandinavians from Sweden, Norway, and Denmark but these ethnic groups were mostly concentrated towards Lakeville. Those from Germany and Eastern Europe would gradually join the minority from the packing jobs in nearby South St. Paul. Irish descendants maintained the majority through the early 1950s owing to the town's origin, overall land ownership, and the practice of marrying within ethnic clans. The early 20th century's permanent population remained very low as the Minnesota River's lack of bridges and streetcar connection isolated the area from development, preventing people from moving south of the river. The lake-side houses around Crystal Lake and Orchard Lake however attracted several various immigrant and first-generation wealthier individuals to temporarily settle or own land in the town limits. In 1960, the U.S. Census Bureau recorded the population of Byrnesville Township at 2,716 people and soon after, the postwar growth was instantaneous, filling the city with second to third generation European descendants from Minneapolis; more American than ethnic. From 1960 to 1970, the total population accelerated to nearly 20,000 people and by the year 2000, the population arrived at roughly 60,000 people. As of the census  of 2010, there were 60,306 people, 24,283 households, and 15,656 families residing in the city. The population density was 2,421.0 inhabitants per square mile (934.8/km2). There were 25,759 housing units at an average density of 1,034.1 per square mile (399.3/km2). The racial makeup of the city was 77.5% White, 10.0% African American, 0.4% Native American, 5.0% Asian, 0.1% Pacific Islander, 3.5% from other races, and 3.5% from two or more races. Hispanic or Latino of any race were 7.9% of the population. There were 24,283 households of which 32.1% had children under the age of 18 living with them, 48.4% were married couples living together, 11.5% had a female householder with no husband present, 4.6% had a male householder with no wife present, and 35.5% were non-families. 27.6% of all households were made up of individuals and 8% had someone living alone who was 65 years of age or older. The average household size was 2.47 and the average family size was 3.03. The median age in the city was 35.9 years. 24.1% of residents were under the age of 18; 9% were between the ages of 18 and 24; 28.6% were from 25 to 44; 26.7% were from 45 to 64; and 11.7% were 65 years of age or older. The gender makeup of the city was 48.7% male and 51.3% female. Burnsville's biggest employer is its own school district, Independent School District 191, followed by Fairview Ridges Hospital, UTAS Sensor Systems, Northern Tool + Equipment, Pepsi-Cola Bottling, YRC, Mackin Educational Resources, Cub Foods, Frontier Communications, and AMS Holding. Manufacturing is the second largest industry. Many employers, including Northern Tool + Equipment, Abdallah Candies, and UTC Aerospace Systems, are in the industrial areas in the southwest and the north, with corporate headquarters and modern warehouses in services and manufacturing. Service firms such as internet utilities, news, and real estate are mostly located throughout the north along Highway 13. Almost every brand of car dealership can be found along I-35W on the north and south ends of the city. Retail shopping is located along County Road 42 and Highway 13 in the west and east sections of the city with local shopping nodes positioned throughout. The largest strip, County Road 42, is lined with suburban strip malls, restaurants, goods and grocery stores. Burnsville Center as the anchor of the strip is a 1,275,703-square-foot (118,516.7 m2) regional mall. Burnsville has a 15–30 minute commute vicinity to many regional attractions and services such as the Mall of America, Valleyfair Amusement Park, Buck Hill Ski Area, the Minneapolis–St. Paul International Airport, downtown Saint Paul and downtown Minneapolis. Adjacent cities of Apple Valley, Bloomington, Lakeville, and Savage provide even more nearby shopping hubs, lakes and parks. Nicollet Commons Park – Burnsville's "Heart of the City" project is a downtown development policy driven by smart growth. Burnsville's "Heart of the City" project is a downtown development policy driven by smart growth. The redevelopment encompasses 54 acres (220,000 m2) centrally located in Burnsville, a few miles south of the Minnesota River. The 1150 seat post-modern style Burnsville Performing Arts Center, now The Ames Performing Arts Center, opened in January 2009. Its approval in 2007 was controversial. Grande Market Square at Nicollet Avenue and Burnsville Parkway is the cornerstone of the Heart of the City project, and features a Doron Jensen-signature restaurant. Homes and businesses in Burnsville receive the same television, news, and cable stations as most metro area cities, provided by Comcast and Time Warner Cable. Burnsville Community Television (BCTV) provides public access programs and information. The Burnsville Sun Current and Thisweek Newspapers supply local news and the Minneapolis Star Tribune recently created a South section dedicated to South of the River news. Land around Black Dog Power Plant is recreational, including Mel Larson Field, the BAC's football only field. The city contains 1,800 acres (7.3 km2) of parkland spread throughout 79 parks and is managed by the Burnsville Parks Department which follows a Parks & Trails Master Plan. Only a third is developed and for recreation with the remainder preserved as natural habitat. Burnsville north border with the Minnesota River is within the Minnesota Valley National Wildlife Refuge. Crystal Lake is the city's major recreation lake allowing boating, fishing, jet-skiing, and swimming. The Burnsville Skate Park is a free facility during summer hours. The Burnsville Ice Center has two large professional ice rinks. The Burnsville Athletic Club is an all-volunteer youth sports league. It has an annual participation of nearly 1,300 players in the baseball leagues for grades K-12, 80–90 boys basketball teams in grades 3–12, and over 400 players in flag and tackle American football in grades 2–8. There are also traveling teams for boys' and girls' basketball, girls' fast pitch softball, and 8th grade boys football, which play against similar teams from around the state at a higher competitive level. Other adult sports are provided through the city's recreation department, other recreational organizations, and minor league groups. Burnsville operates as a Statutory Plan B city under the Minnesota Legislature. Government consists of an elected City Council of one executive mayor and four council members. All four council members are elected at-large to serve four-year terms. The Mayorship term was changed from two to four years in 2000. Administrative duties including employment of the city are in charge of the City Manager. As one of many Minneapolis–Saint Paul metropolitan municipalities, the city is required to regularly submit a Comprehensive Plan detailing infrastructure and development progress to the Metropolitan Council. The city is situated in both Minnesota's 51st Senate District, and Minnesota's 56th Senate District. Currently, the state senators are Jim Carlson (DFL), District 51, and Dan Hall (GOP), District 56. The state representatives are Sandra Masin (DFL), 51A, Hunter Cantrell (DFL), 56A, and Alice Mann (DFL), 56B. Burnsville is located in Minnesota's 2nd congressional district, represented by Angie Craig, a Democrat. About 20.0% of Burnsville's students attend Independent School District 196 schools; they include: Apple Valley High School, and Valley Middle School, in Apple Valley; and Echo Park Elementary School in Burnsville. About 10.0% of Burnsville's students attend Independent School District 194 schools; they include: Lakeville North High School, Kenwood Trail Middle School, and Orchard Lake Elementary all of which are in Lakeville. Burnsville is a fully developed suburban bedroom community. Large pockets of ramblers and split-level houses were due to Interstate 35W's completion in the 1960s which came earlier than most of the metro highways. Burnsville through the 1990s filled in the last of its available land with upscale housing stock and apartment complexes. In the 2000s Burnsville went under redevelopment activity, producing many four-story residential buildings. The "Heart of the City", a new downtown area, contains mixed-use residential and retail buildings. This has produced a diverse range of housing types from single-family homes to high-density condominiums. Since the city was developed in a sprawl fashion, new and old buildings sit between each other. The original industrial area along the Minnesota River is mostly abandoned, and also contains a sealed land-fill site. The new industrial area in the west side of the city contains manufacturing and corporate headquarters. West of the new downtown area are new office buildings. Minnesota Valley Transit Authority provides regional bus service between many transit hubs within the city, south of the river, and to destinations such as the Mall of America, Downtown Minneapolis, and Southdale Mall. Most residents commute and move around by car. Burnsville contains the Interstate Highway 35 split with Interstate Highway 35W leading to downtown Minneapolis and Interstate Highway 35E to downtown St. Paul. The major on and off-ramps for I-35W are located at Burnsville Parkway, County Road 42, and State Highway 13. County Road 42 and State Highway 13 both provide east-west access to the western suburb of Savage and the eastern suburbs of Eagan and Apple Valley. Major interior arteries include Nicollet Avenue, McAndrews Road (East 138th Street), County Road 5 (Kenwood Trail), County Road 11, Portland Avenue, Southcross Drive, and Lac Lavon Drive. Fairview Ridges Hospital located south of City Hall along Nicollet Avenue is a 24-hour facility, touting the most advanced emergency, surgery, orthopedic and childcare south of the river. The hospital is within The Ridges campus which includes various medical clinics, services, centers and institutes. Nearby is a Park Nicollet Health Services. current professional basketball player for the Tianjin Gold Lions. World Cup alpine ski racer on the US Ski Team. co-founder of Timber Lodge Steakhouse and Old Country Buffet; owner of local Jensen's Cafe. current NBA player for the Minnesota Timberwolves. current NHL player for the Vancouver Canucks. Cole Aldrich, basketball player for the Minnesota Timberwolves was born in Burnsville, but moved to Bloomington at a young age. Breanne Düren, singer/songwriter, touring keyboardist for Owl City. ^ a b "Population Estimates". United States Census Bureau. Archived from the original on October 19, 2016. Retrieved June 2, 2016. ^ KEVIN MALER (2006-04-30). "Suburbs Want Downtowns of Their Own". New York Times. ^ a b c "BURNSVILLE 76; A COMMUNITY HISTORY". Burnsville Heritage Committee. 1976. Archived from the original on 2009-07-31. Retrieved September 8, 2007. ^ a b c d Dakota County Historical Society (2005). "Historic Sites: Burnsville". Archived from the original on December 30, 2003. Retrieved September 8, 2007. ^ a b c John Gessner (January 7, 2001). "Burnsville looks back at a rich history". Thisweek Newspapers. Archived from the original on February 8, 2009. Retrieved September 8, 2007. ^ "Mdewakanton Band of the Dakota Nation (Part II)". Minneapolis Public Library. 2001. Archived from the original on September 25, 2008. Retrieved 2008-08-19. ^ "1860 United States Federal Census for Burnsville, MN". 1860. Retrieved 2014-04-25. ^ a b E. D. Neill (1881). "History of Dakota County, 1881". Archived from the original on 2009-07-31. Retrieved September 8, 2007. ^ J. Fletcher Williams. (1881). "Biography of Lewis Judd, The History of Dakota County and the City of Hastings". North Star Publishing Company. Retrieved 2008-11-05. ^ "Bloomington Briefing" (PDF). City of Bloomington. December 2004. Archived from the original (PDF) on November 28, 2007. Retrieved September 8, 2007. ^ "Bloomington history". City of Bloomington. 2008. Retrieved 2008-10-10. and Barb Puch (1976). "THE DAY GRINCH TRIED TO STEEL BLACK DOG". Burnsville '76 A Community History. Archived from the original on 2009-07-31. Retrieved 2008-10-10. ^ "Burnsville Heart of the City Evolution". City of Burnsville. Archived from the original on 2012-07-24. Retrieved 2008-08-20. ^ City Council (March 13, 2007). "WORKSESSION MINUTES". City of Burnsville. Archived from the original (DOC) on November 28, 2007. Retrieved September 8, 2007. ^ "Lower Minnesota River Watershed District". Archived from the original on June 5, 2008. Retrieved July 7, 2008. ^ Betty Sodomka (1976). "What Life Was Like... Back Then". Burnsville '76, A History. Archived from the original on 2009-10-20. ^ "City of Burnsville 2009 Comprehensive Annual Financial Report". Archived from the original (PDF) on October 1, 2011. Retrieved January 3, 2019. ^ "Burnsville Fire Muster History". Archived from the original on November 19, 2006. Retrieved April 11, 2018. ^ "Burnsville Fire Muster World Record". Archived from the original on 2011-07-08. ^ a b c "ELIZABETH B. KAUTZ biography". City of Burnsville. 2007. Archived from the original on December 11, 2007. Retrieved June 25, 2008. ^ Harry Chatten Boyte, Nancy N. Kari (1996). Building America: The Democratic Promise of Public Work. Temple University Press. ISBN 1-56639-458-9. ^ JOY POWELL (June 25, 2008). "Burnsville mayor in line to lead colleagues on national council". Star Tribune. ^ Jay Powell (February 27, 2009). "Burnsville officials say Arts Center won't mean higher taxes". Star Tribune. Archived from the original on December 18, 2014. Retrieved April 11, 2018. ^ "Trevor Laws". The Official Site of Notre Dame Athletics. Retrieved October 14, 2012. ^ "Mike Lundin". The Official Site of the Hockey Hall of Fame. Retrieved October 14, 2012. Wikimedia Commons has media related to Burnsville, Minnesota.